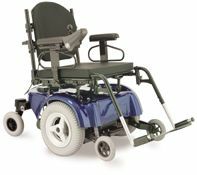 The Jazzy 1400 combines the high-end rehab capabilities of the Jazzy 1420 with a narrower power base for enhanced indoor maneuverability. 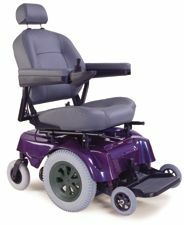 Designed specifically for people with high-end rehab needs, the Jazzy 1400 presents an extensive array of standard rehab features including the versa seat frame, which accepts a broad range of seating, swing away leg rests and fully programmable digital controller switch use plug and play technology to interface with a wide variety of specialized drive controls. In addition, the Jazzy 1400's new FST (Full Suspended Technology) reticulating beam, Active-Trac suspension and optional high speed motor package combine to provide outstanding outdoor capabilities while not compromising indoor maneuverability.